It has been 4 billion years since the earth was formed, starting from microscopic creatures to become complex creatures like now. Surely this world has been inhabited by millions of species, either extinct or still surviving. The shape and habitat also vary, there are those on land and air all have their own habitat. But climate change or damage to their habitat is undeniably the main cause of the extinction of these animals. Therefore we must know what animals are threatened with extinction below, who knows these animals are around us. 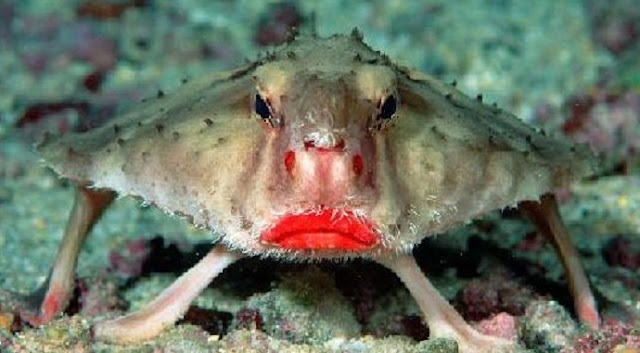 Fish commonly called Red Lip Bats are very unique and cute with bright red lips like wearing a lib stick. This fish lives in the Pacific Ocean around the Galapagos Islands and off the coast of Peru. They can't swim, so it's more often on the seabed by dragging their bodies using their four cute legs and fins that are similar to bat wings. When grown up this fish can reach a width of 40 cm with hard bones on its back. These animal favorite foods include shrimp, small oysters, and small fish. They seek prey with camouflage behind the sand. This cute animal is actually not the type of ant, but a kind of bee without Euspinolia militaris wings. But don't be fooled by his appearance. Actually this animal is very poisonous. 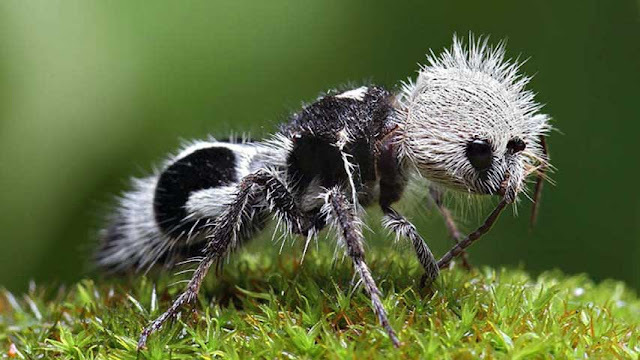 The panda ant can kill a cow in one sting, so this animal is often called the cow killer. First discovered on the beach of Chille in 1938, this animal measures about 8 mm in length and 2 mm in height with a black and white pattern similar to a panda. Unfortunately this animal population is shrinking because it is easy to eat predators, they are only able to live within 2 years, not to mention they only lay 2000 eggs every year. They often look for prey after sunset. 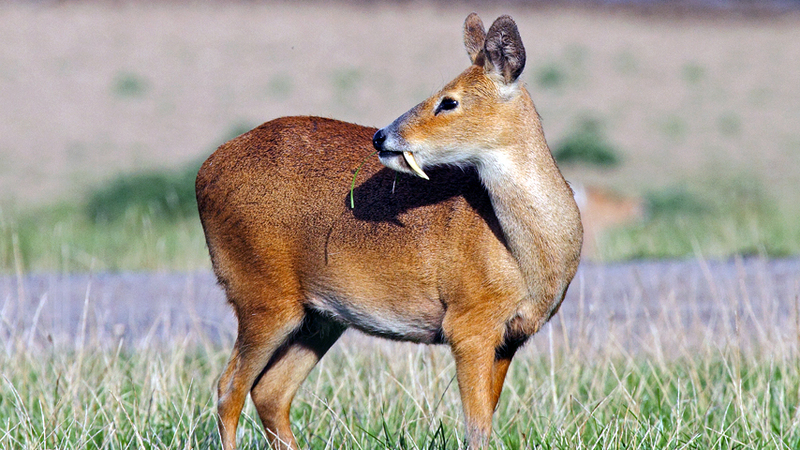 The vampire deer is indeed the name that fits pinned for this deer species. Because the mouth that is stuffed with features of fangs that stick out of his mouth reminds us of vampires. But these animals are not blood sucking like vampires, deer species are still grass-eating herbivores. The fangs only function as a tool to fight fellow males to fight over the female. According to news circulating this Deer has disappeared for 60 years and was rediscovered in a remote forest in northeastern Afghanistan. Previously this deer was known by the nickname deer of Kashmir often found in the Indian Himalayas. This deer is threatened with extinction because of the hunting of its oil glands which are said to exceed the price of gold. This gland is used for perfume and medicine and is marketed on the black market. Axoloth is a type of lizard that lives in water. Their native habitat is from Xochimilco Lake and Chalco Lake in Mexico. There the animal is nicknamed Mexican Walking Fish because it is like a walking fish. 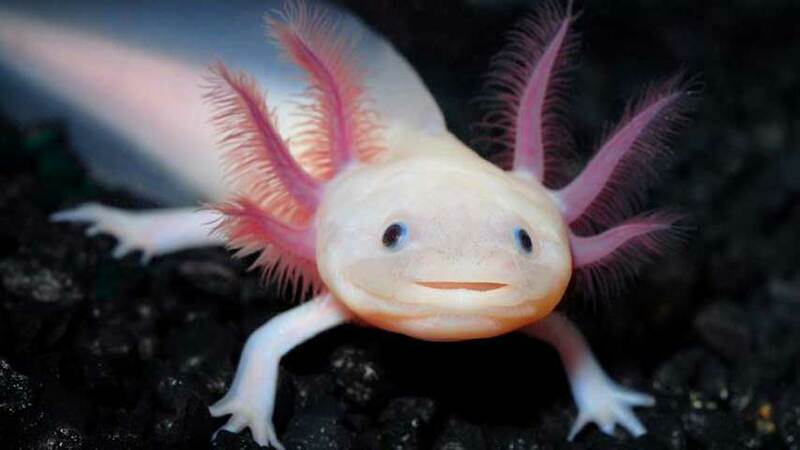 This animal, called Latin ambystoma mexicanum, spends more time in the water with the help of pink gills on its head, sometimes people consider it as a horn like a dragon. The advantage of this animal is its ability to metamorphose when environmental conditions dry out without water. When transformed into a feature landline reptile that is usually used in water it will shrink like gills and fins on the tail and protruding eyes become lizard-like. Like other fish, Axoloth likes to eat worms, larvae and other smaller fish. Red pandas (Ailurus fulgens) are the only species from the family Ailuridae. They look like red foxes but with more funny and adorable stature. Almost the entire body of the Red Panda is covered with thick, thick fur, brownish red with strips on its tail. Like a black and white panda, this type of panda likes to eat bamboo, grass, fruit and other plants. Occasionally they eat small animal eggs to add nutrition. 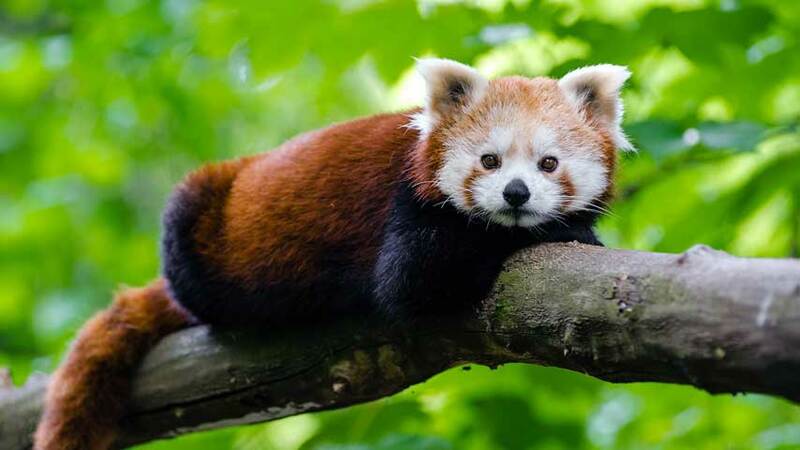 Red Panda is often found around the Himalayas. Funny faces are the cause of this Panda threatened with extinction as reported in national geographic. They are often hunted for their feathers and taken abroad as pets. To protect this species a conservation area was created at The Padmaja Naidu Himalayan Zoological Park, Darjeeling, India. According to conservation experts, only about 10,000 red pandas are left in the wild. Kakapo (Strigops habroptilus) also called the Owl Birdet is a crooked beak that lives in New Zealand. Kakapo's face is flat like an owl but unfortunately, this animal cannot fly. You could say the only bent beak bird that can't fly because it has small wings and a heavy body. Although unable to fly, Kakapo can climb trees to the highest peak. 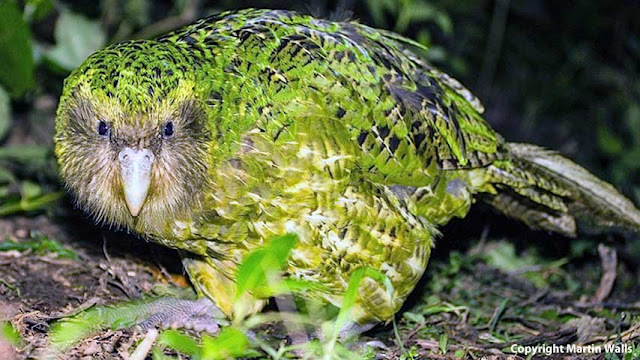 Kakapo includes nocturnal animals that look for food at night they eat fruit, seeds, pollen, and bark. The color of green feathers serves to disguise them from the threat of predators by blending with vegetation that resembles its color. Early The cause of the depletion of the population was when humans began to occupy their habitat in New Zealand. They hunt their feathers for their coats and head for ear accessories. The nature of kakapo that is sculpting when threatened makes it easy to be caught. At first glance, this animal's nose is like a dent hit by something, but it's not the case. Saiga Antelope is the strangest deer species ever. With a large, elastic nose that points downward to filter the dust produced by the legs of their flock while migrating, it also functions to cool the blood in the summer. Their colonies are scattered in the Eurasian steppe region from the foot of the Carpathian mountain, the Caucasus to Mongolia. 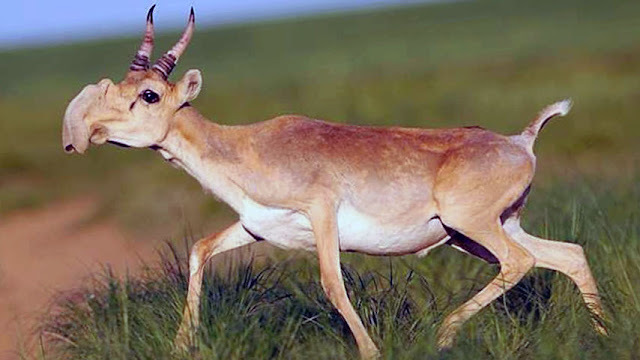 However, most of the extinct lives remain in the area of The Republic of Kalmykia and a small part of Kazakhstan is the main cause of the reduced Saiga Antelope population, among others due to climate change and mass hunting. Bearded Vulture or can be called a bearded vulture has its own unique black feathers dangling from the eyes to past the beak. Bearded Vulture is also the only carcass that is not bald. This species is also a tough predator like an eagle weighing 4.5-7.8 kg with a wingspan of almost 3 meters. Equipped with bigger feet to grab prey. 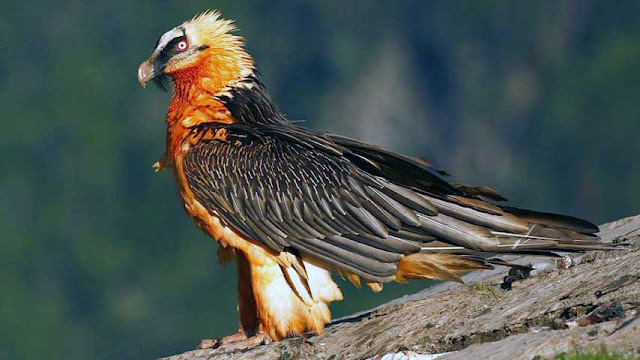 That said, Bearded vulture can lift large prey like a goat and drop it from the top of a cliff. Surprisingly, these animals prefer bones rather than meat. So they waited for the meat to be eaten by other predators before eating the bones and their contents. They also break a large bone by taking it to an altitude of 50-150 m and then dropping it on a rocky cliff. At first glance, these animals are like zebra crossing and donkeys, but actually, Okapi belongs to the Giraffidae family or is related to the Giraffe. Okapi can be found in tropical forests around the northeast of the Republic of Congo, Central Africa. Like giraffes, they are also herbivores that eat leaves, grass, fruit, and flowers. Based on the evolutionary study of the ancestors of okapi and giraffe, Samotherium. According to paleontologist Kathleen Hunt, Samotherium split into Okapia 18 million years ago and Giraffa 12 million years ago. Unfortunately, the number of Okapi populations is decreasing due to habitat disturbances, deforestation and hunting. It is estimated that now there are only around 10,000 left. 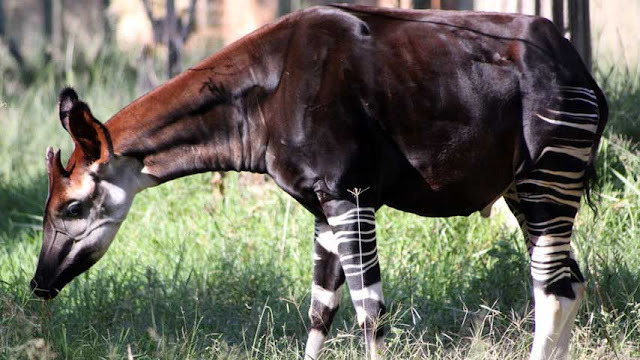 Very expensive Okapi meat makes many people hunt for meat to be sold in the market. 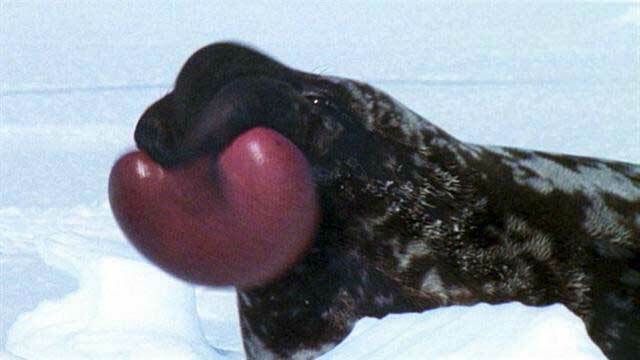 Hooded seal (Cystophora cristata) or hooded seals are the strangest seals species found in the North Atlantic region. Its peculiarity lies in the color of its body of light gray black-colored ash and a red "balloon" stuck under its nose. These "balloon" membranes can expand and collapse, they inflate this membrane by blowing it from their noses to attract females in the breeding season. Adult hooded seals can reach 2.6 meters long and weigh between 300-410 kg. The Hooded Seal can dive to a depth of 600 m. They are prey on small fish such as shrimp, redfish, and Zeppelin which are rich in fats and fatty acids. Hooded seals are endangered because they are hunted for the skin and oil deposits. To protect the population, the Northwest Atlantic Fisheries Organization (NAFO) conservation agency plays an important role in controlling hunting practices.